Well here goes. 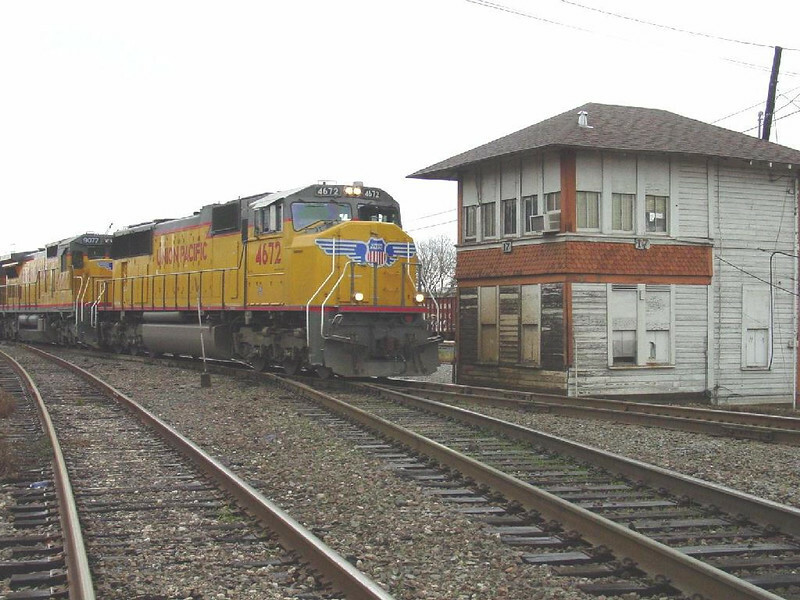 It is something I will have to scratchbuild as there is nothing like it available on the kit market, the interlocking tower at the Junction of the SP (now UP) Sunset Route and the Santa Fe (now BNSF) route from Galveston/Houston to Hearne Texas in Rosenberg, Texas. I started building the base boards over ten years ago and most of the track is now laid but the signature structure, what gives the location its name, Tower 17, is still to be built. The tower was originally a near square structure with two sides each comprising five bays/windows and four bays on the other two sides. The tower was extended some time later in the 1950s by an extra three bays on the shorter side making it seven bays by five. 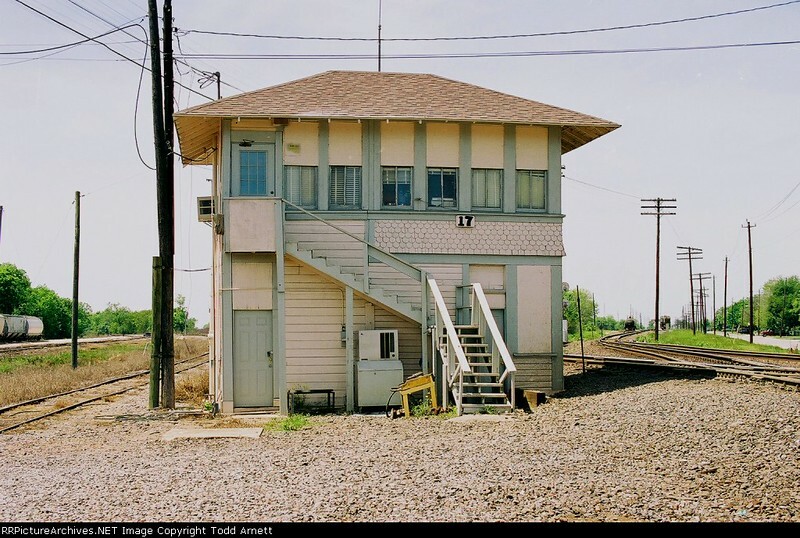 The tower was sited between the tracks by the diamond crossing but now resides a few hundred yards to the East in the Rosenberg Railroad Museum. 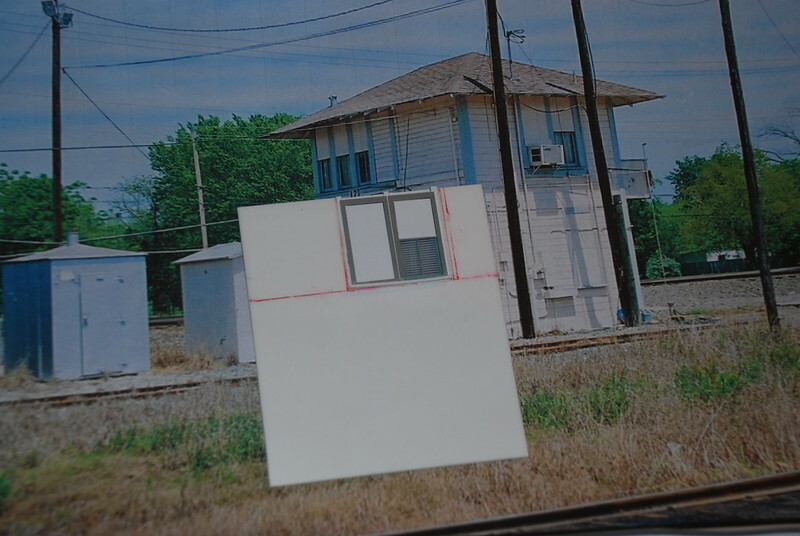 The five bay sides faced South (backing onto the yard tracks with just one window - a second was totally boarded up) and North (over the diamond with five windows), with the seven bays sides facing East towards Houston/Galveston (with six windows and one door) and West (with three windows and four blanks). Here is the East side, in its last colour scheme before removal, after UP and BNSF had taken over (thanks to Todd Arnett). The lower floor windows are all blanked out, completely. It will not need to be a total build from scratch as I have identified that the upper floor windows are a great match for the Grandt Line part #5195 RGS Style 4 pane window. It will be a shame to cover some of the detail as the upper panes are all blanked out with a plywood sheet painted white in the period I want to model which is in the years just before its closure and removal. I may also attempt to put in some interior detail from photos. I shall start by constructing the window sections for the upper floors in order to get the all round measurements. 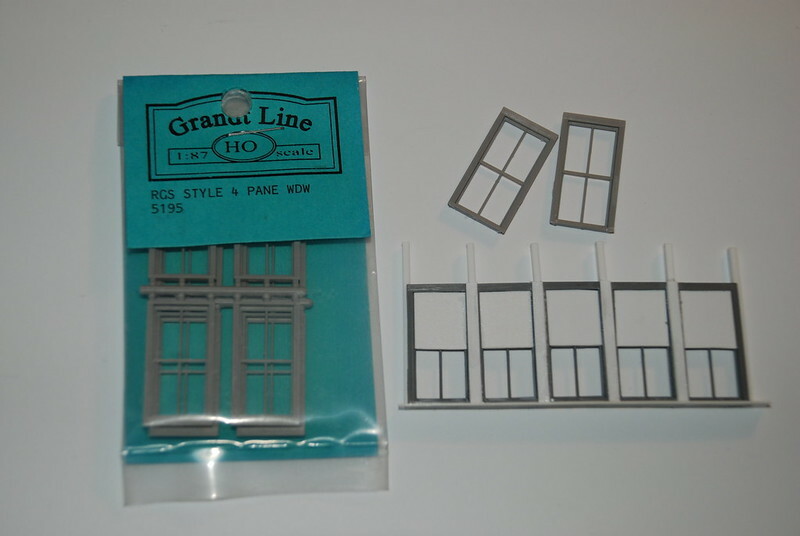 The windows will be assembled with a 60 thou square section plastic rod between each window frame, mounted on a window sill cut from 20 thou plasticard. It is not an accurate science but that seems to be the appropriate spacing in HO from the photographs I have located. I will then mount it all on its floor before proceeding with the construction of the lower floor. Last edited by tunnelmotor on Tue Jan 06, 2015 5:10 pm, edited 1 time in total. Two days down the road and I have made an earnest start. I have no measurements to go from apart from the windows so I shall assume that they will be perfect (or close to it) and will build the whole tower around the windows on the upper floor as my guide. I started by placing five windows in a row from Grandt Line pack #5195 (four in each pack) and I secured them together in a row with a spacer between each window formed of 60 thou square section rod from Evergreen (part #153) flush with the bottom but overlong at the top as I am note sure yet how far to take the upper wall into the overhang of the roof. I overlaid each upright with a strip of 20 thou plasticard 2.5mm by 26.5mm. A window sill was fashioned from 20 thou plasticard too, 4mm by 75mm and secured this in place at the foot. To represent the plywood sheets over the upper pains of glass I added more 20 thou 11mm by 12.5 to fit inside the windows frames. I then moved to the front, East-facing, wall and built up a section of six windows,in sets of four and two, just as before. The four were added to the twpo with a wider section between them- see photo of prototype - it is where the tower was extended and thus the join is wider/stronger. The sill was added and dovetailed to allow the North side to fit in against the end posts fashioned from 40 thou square section with 20 thou strips added to bulk them out to in effect 80 thou square. This assembly was then attached to a sheet of 60 thou plasticard that will act as the structural strength of the lower side - this was measured at 99mm by 53mm to allow for the addition of the door. The door is from a Rix Products kit with the window opening lengthened downwards to look more like the freal thing in the photo. And here is that sub-asembly put together with a photo of the tower behind. When I hold it up in front of the photo, at the right distance and with one eye closed, all the windows, door and outside measurements do actually like up!!!! The sill at the right end will be cut short when the North-facing side is added. Although I have not posted in a few weeks, i have in fact been busy this last week since Christmas is over and a few jobs are put to bed. I built another window sub-assembly for the North side with five window panels, all joined together just as before and sat a sill of 20 thou; the Wesy side of three windows is also together waiting the cutting of the West side wall to mount it on. The two window sub-assemblies for North and east sides were offered up to each other and were cemented with liquid polly after trimming the sills to dovetail togther and ensuring a 90 degree corner and sgtraught bottom edge. I the cut the lower wall for North side from 40 thou plain plasticard to fit overlapping the East wall. This was reinforced with a laminate of 60 thou plasticard in behind leaving a gap of 60 thou at each end to take the East wall(and later the West wall). I also reinforced the window sill with 20 thou square section. I next measured out the area for the tiling (or rather the shingles)- this is an apron that was on the original interlocking tower immediately below the sills and was retained when it was extended. The timbers show that it is extended too - the uprights are two separate pieces of timber and the planking on the lower wall does not match up either. The pillars at the "join" were extended downwards 11mm and a cross memnber of 60 thou (3mm by 62mm) was put in place horizontally to give the area for the shingles. Next step was to find the right size planking - I had Evergreen V-cut and clapboard and some Slaters. Evergreen is quite thick (40 thou) and I did not have that depth to play with so the Slaters was cut to fit in two pieces, the "new" wall, 52mm by 25mm from sill to ground and the original wall 38mm by 30mm. I was careful to cut the latter so that half a plank showed at the top and the joins did not align between new and old per the prototype. It is not quite the right spacing for the old wall but scribing blank card was the only option that would have curved the plasticard - so I compromised by maintaining a stagger between old and new sections. Door frames were cut from 40 thou square section and glued in place. The corner post was built up from layers of 20 thou strip. The ebtween the right hand door franme and the corner post I slotted in the wood section plating over the window, uisng a panel of 40 thou cut to shape. A window sill was added from 20 thou square section. The door frame was then built out again with a 10 thou strip so it sat wider by the window and narrower below the sill per the prototype. The photo shows the work thus far plus some paint applied to the frames in a pale blue - I need to paint all window frames before the glazing can be applied from behind and I want to mount venetian blinds also. I am not sure the pale blue is pale enough so that may still change. A third piece of Slaters planking was inserted in the small area below what was once the window. At the South end of the wall - the right side, I added a corner post from 60 thou square section from which to build out and onto the South wall. 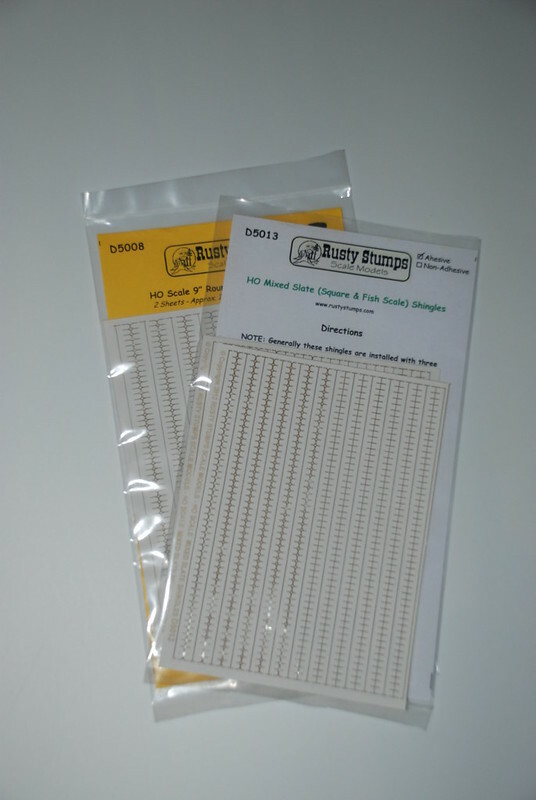 My shingles arrived in the post today from Rusty Stumps in Indiana, just 8 days including the New Year holiday so I shall be able to trial fit some very soon. Again they are not quite right the right size (should I have gone for N scale ones?) and certainly nor were the Wills Scenics plasticard scalloped tiles that I had intended using at first but they are way too large and too bulky as well. Last edited by tunnelmotor on Wed Feb 25, 2015 11:43 am, edited 1 time in total. Despite my concerns that the Rusty Stumps shingles would be too large, they are in fact quite perfect. I can lay them line on line as close as I want and can get all seven rows into the space I have built into the tower thus far. 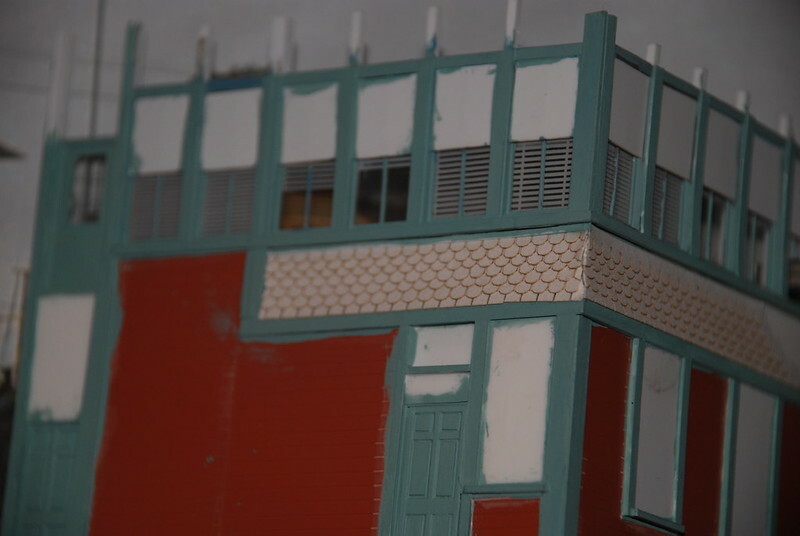 So in order to play with my new toys, I had a shot at laying shingles on the main front face of the tower. They were very easy to work with. Simply remove one strip from the "etch" and cut to length. 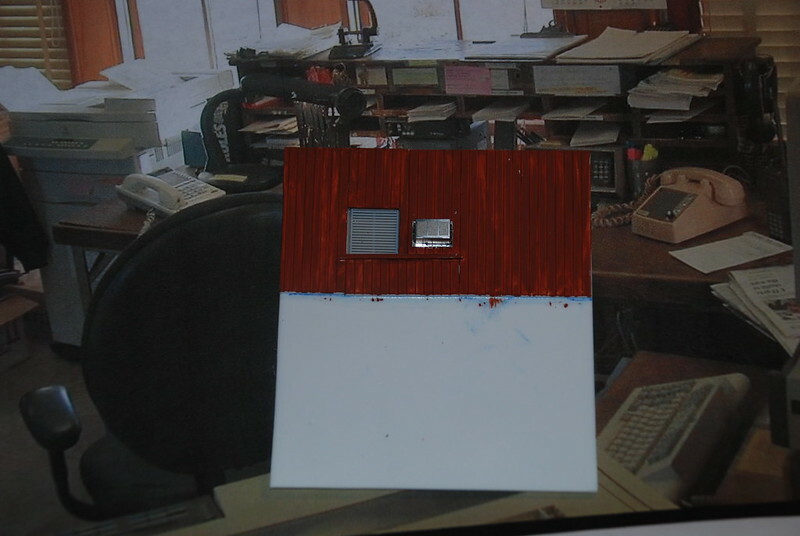 I chose unpainted/unstained shingles as they are painted white on the prototype. I started with the straight/regular edge ones for the bottom row, peeling off the backing paper with the use of a scalpel blade. This row very slightly overhangs the blue cross member below it. I followed this with a row of scalloped shingles and so on. As you can see below the bottom bends out over the cross member whic required careful trimming at the corners. 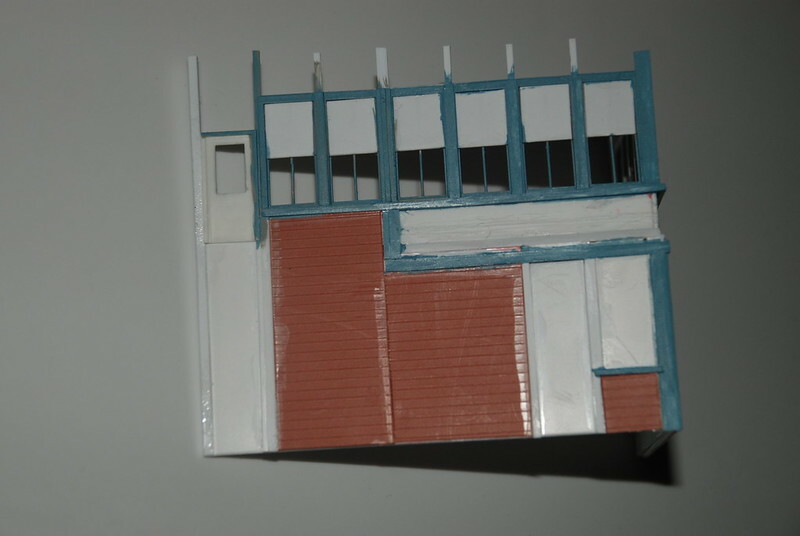 As the photo shows i also made a start on the inside details - the venetian blinds and glazing. It was important to piant the glazing bars of all windows before the glazing was applied. I used the sheets of blinds by City Classics and cut the glazing to size to fit within the franes of each window. Some have blinds raised; others have them fully down (and closed on the prototype) and some partly down. All photos of the prototype show the blinds in the same position whatever the date! When I came to decorate and furnish the interior I realised why - cupboards and storage are backed hard up against them so they no longer need to function. I discovered that the vinyl sheet used by City Classics does not respond to any plastic/acetate glues I have so I decided to use a little superglue plus a solid franme to hold them in place should that glue ever fail. First the glazing was cut abnd fitted in place. Then I glued a strip of 40 thou square Evergreen strip along and over the bottom edge. Next I cut out the internal wood panelling (80 thou planking on 40 thou card) from Evergreen V-groove planking (product #4080) down to the midpoint of each window and a strip of 30 thou plasticard across the back coinciding with the top edge of the glazing this preventing any vertical movement. Strips of 40 thou by 80 thou fitted down between each window frame trapping the gklazing at the sides. I repeated this for all the windows on the two sides made up so far. 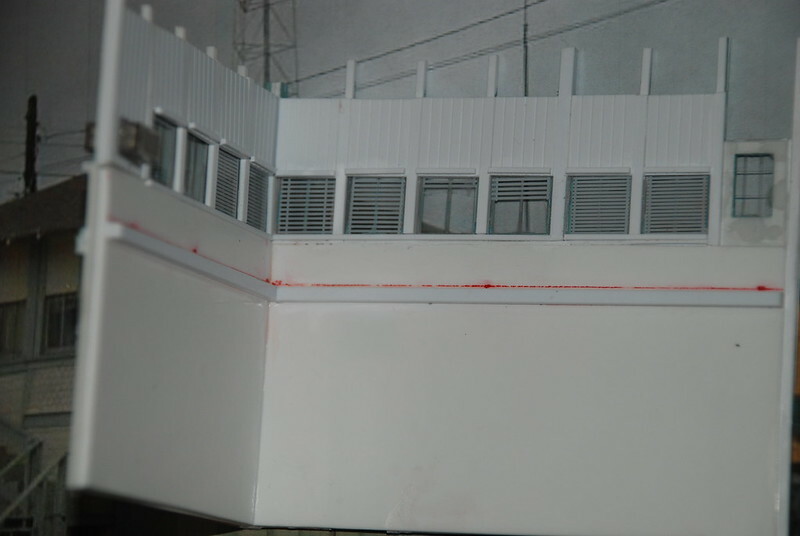 I also applied some plain glazing to the door and then scribed on glazing bars to match the prototype. Last edited by tunnelmotor on Thu Feb 26, 2015 11:35 am, edited 3 times in total. Next stage was to build the third west facing side using the same process as for the first two sides. It was all made square by cutting from 80 thou card the floor to go in at (US) second floor height, resting on 125 square section formers across all three sides, cut to fit. The only difference with the third side is that there appear to be vents at the top of the window panels on the (US) first floor - I fashioned these from 10 thou by 20 thou strips glued on their thinner edge across the top section. The one remaining window that has glazing alos appears to have a white coloured roller blind so this was created by painting white on the inside face so far down - getting a straight edge was a nightmare! Once happy with that I painted the panelling a suitable brown colour to match the interior of Tower 17 as best I could. It was all going to plan. As you can see I could not resist the temptation to paint the floor a light grey to match the floor of the tower and plant some furniture from a Faller kit for detailing a signal box. The tables were painted to match those in the photos of Tower 17 interior. The metal lockers were cut from 125 thou square rod to length and pao=inted a dark grey and glued in place hard against the windows. So now the fourth, south-facing side. Again the same processs used building up from 60 thou sides but with window aperture cut out for the one remaining window with glazing visible. The other two are blanks and I made them as dummies. Varying sizes and thicknesses of Evergreen strip were used to fashion the frames, cross members and uprights on the corners to bring it all together. Slaters planking used to dress the outer surface. Inside the same process was used as on the other sides to give the impression of wood panelling. The side was then glued in place on the three sided tower and further Evergreen strips applied to the corner posts to complete. 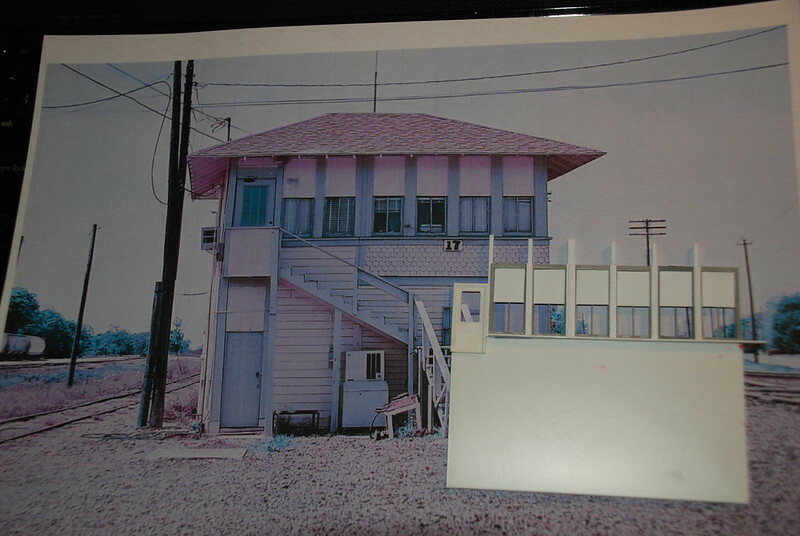 An air conditioner by BLMA (etched kits) of a suitable style was made up, tabs filed smooth and superglued to the lower part of the upper dummy window. Another one was made up and glued inside to give the impression of an air conditioner sitting in an opening in the window frame. The Rusty Stumps shingles were applied to the remaining areas - that was really quite fun and I can strongly recommend them. The square sections running up through the structure were now all cut back to a constant height and a final application of 40 square strips across the tops of each panel and all walls brought the tower to where it now is. 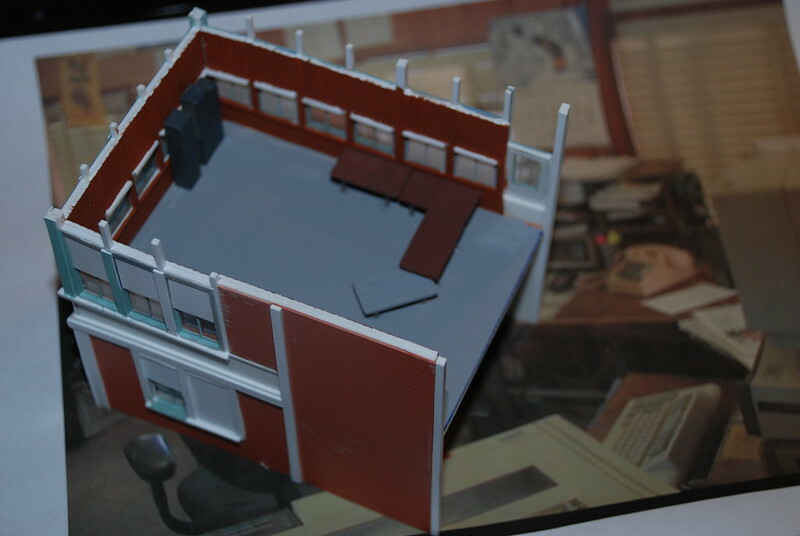 The next stage is to complete the furnishing of the interior with office detail parts from a Kibri kit inlcuding desk computers. 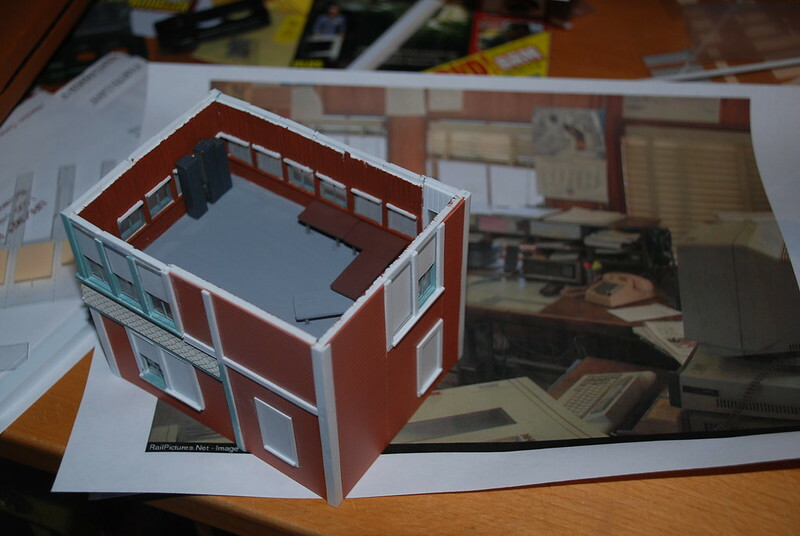 It also needs a fair bit of clutter like papers strewn everywhere and pasted to the walls and a scratch-built interlocking cabinet before we turn to the roof (which will be removable) and the outside stairs. Like Richard I have run out of time. It was a very worthwhile exercise in two respects: I documented what I was doing which may well help if I put this in for AP assessment and secondly it got me started buildiung what is the signature structure on my entire layout, Tower 17, Rosenberg, Texas. If I may I will continue to document this here or elsewhere thriough to completion. Just the roof (to be removable for AP assessment) and the stairs!!! I think too that feedback and questions along the way would have been better. I do not see that a typical Roundhouse article can be gleaned from what we post - they are all way too long and would be suited to an e-magazine as they are. Perhaps a summarised version will be needed. Hi Mike, topic is now in Buildings and Scenery and go ahead to with your construction and posting. The uncompleted items have not been added to the poll, but people are free to comment on it now. (see my 'lessons learnt' post for more on that).